WASHINGTON — The United States will get its first taste of divided government under President Trump this week when a Democratic House tries to wrest control of the political agenda from Trump, who appears determined to keep the focus on border security, immigration, and his “big, beautiful” wall. After the midterm elections ushered in the most diverse first-year class in history, House Democrats intend to put a spotlight on the issues that worked well for them during the campaign: diminishing the influence of the wealthy and connected, expanding voting rights, lowering prescription drug costs, and passing a bipartisan infrastructure bill. Trump, on the defensive and presiding over a federal government that remains partially closed, is trying to stomp on that message. On Tuesday, as the government shutdown was in its 11th day, Trump invited congressional leaders of both parties to a briefing Wednesday afternoon on border security. White House officials did not say whether Trump would attend. Trump appeared to make a gesture of peace before Wednesday’s meeting. Just what deal Trump had in mind was not clear. While Pelosi has repeatedly signaled she would like to find a compromise that would allow the government to reopen, she has also made it clear that a wall cannot be part of any such deal, whether or not that leads to a messy start to her speakership. 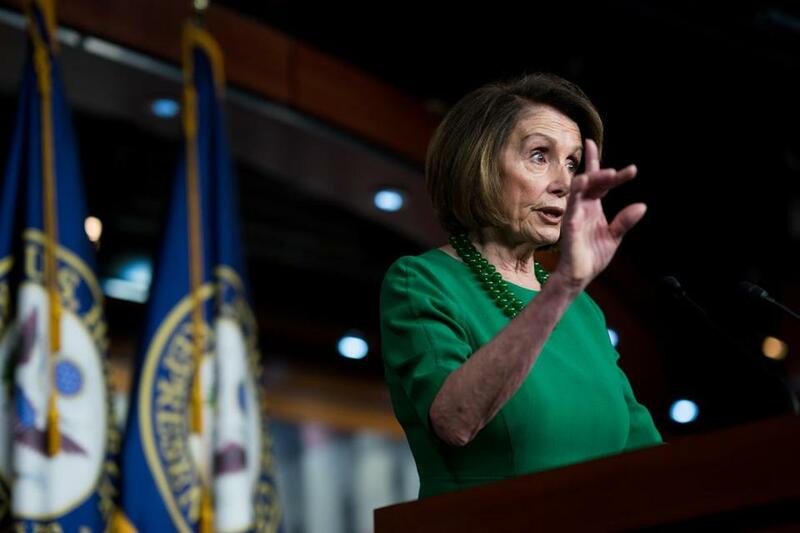 She hopes to introduce a transparency-in-governing measure after she is elected speaker Thursday to portray Democrats as a responsible governing party and draw a contrast between them and Trump’s scandal-ridden administration. The measure would require disclosure of shadowy political donors, end gerrymandering of congressional districts, and expand voting rights. But their first order of business will be reopening the government, as Pelosi said Tuesday on Twitter in response to Trump. Democrats also intend to use their first months in the majority to push for a bipartisan infrastructure bill and legislation to lower prescription drug costs, issues they believe will have bipartisan appeal. The Democrats plan to pass two bills Thursday. The first includes six bipartisan spending measures that would fully fund agencies like the Interior Department and the Internal Revenue Service through the end of the fiscal year in September. The second would fund the Department of Homeland Security through Feb. 8, with $1.3 billion for fencing but no money for a wall on the Mexican border. With the plan facing a shaky future in the Senate and an intransigent president, some rank-and-file lawmakers in both parties are suggesting that a deal to revamp the nation’s immigration laws, pairing border security and protections for some people in the country without authorization, may be the way out of the stalemate. “How about comprehensive immigration reform?” Representative Debbie Dingell, Democrat of Michigan, said on CNN on Tuesday when asked how Democrats intend to compromise with Trump. One of Trump’s closest allies, Senator Lindsey Graham, Republican of South Carolina, has revived his long-stalled immigration proposal to marry $5 billion for the wall with immigration law changes that might appeal to Democrats, including three-year renewable work permits for young people brought to the country without authorization as children, known as Dreamers. Democratic leaders are wary of any immigration negotiations with Trump, whom they view as an unreliable partner. Representative Hakeem Jeffries of New York, the new chairman of the House Democratic Caucus, said Tuesday that Democrats would not again broach immigration before the government is reopened. At the same time, Democratic leaders will face pressures of their own, from a new class packed with first- and second-generation immigrants, Latinos, and immigrant advocates. House Democratic leaders and their staffs have indicated to immigration advocates that they plan to act on legislation to protect immigrants who face an imminent threat of deportation after the shutdown is over. That proposal would grant permanent residence to DACA recipients and to others who came under Temporary Protected Status, which Trump has also moved to rescind.